Such was the conviviality of the country, that my journal proved as maigre as my entertainment was gras, so it never was a dish fit to be offered to the public. Maigre as it is, this account is thrilling to us now as an early example of the kind of raw, jotted text which Pennant subsequently worked up into his published tours; texts which, alas, do not survive (or exist only fragmentarily) for his Scottish and Welsh tours. As a document it is often enigmatic, frustrating, or impossible to decode: but those jotted notes bring us much closer to his actual experience of places and events as they happened than any of his published works. Besides the notebook, a handful of letters from Pennant survive from this summer, written to his aunt Elizabeth, and they provide valuable further insights. displaying various beautyfull branches, always expanded. it readily seized on any bit of fish offered it and made use of those branches to convey it to its mouth; these branches seemed furnished with small nervous papillae which adhered strongly to my finger. This possibly marks the first meeting of two men who would become excellent friends: William Morris (1705-63) would write to his brothers of how proud he was ‘of such an ingenious worthy man’s friendship’. The late June crossing to Ireland was not easy: ‘one part of the time a rolling sea and no wind. When off the Hill of Howth an hard gale from land drove us several leagues North’ – and it was Friday morning before they reached Dublin, where he spent several days seeing the sights, including the College and Museum (‘ill furnished’ but with two British axe heads that he rather liked). 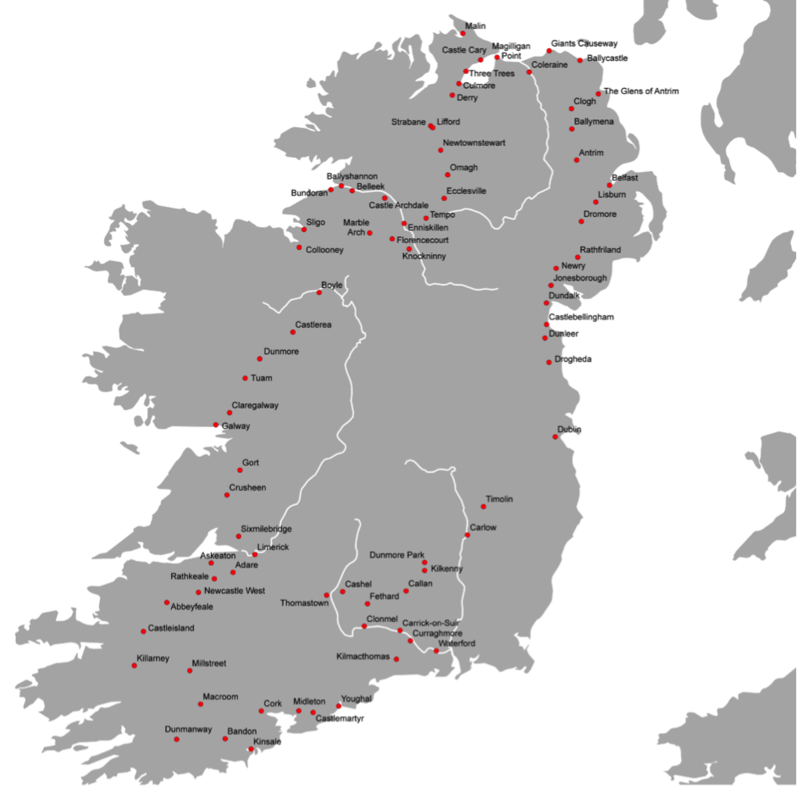 He then proceeded north and toured Ireland anti-clockwise, taking in a wide range of places from Ballycastle in the far north to Cork in the south. Pennant’s Irish Itinerary reconstructed from the journal. With thanks to David Parsons. The country in these parts owes as much to this good man’s industry, as that about Mr Annesley’s (as mentioned in my last) will soon experience from the indefatigable pains of the latter. The difference consists only in this, Mr Annesley is improving his Land, and Mr Boyde is attempting to form a flourishing colliery and a secure Port. The former he has in some measure succeeded in; but the latter seems still in an uncertain state. A turbulent sea, and a destructive insect has done vast damage, a small grub scarce the 8th part of an inch in length having in five years space utterly destroyed part of the finest oake he had employed in his Pier. These entertained my Eyes; but that was not the only sense that was pleased; for my Hearing had its share from the surprizing Echo from the mountains: to enjoy this in the greatest perfection his Ld brought on the water two French horns, a fife, a drum and Two swivel guns: every note was returned to the former, but when the Latter were discharged the loudest claps of Thunder I ever heard were unequal to the sound returned. 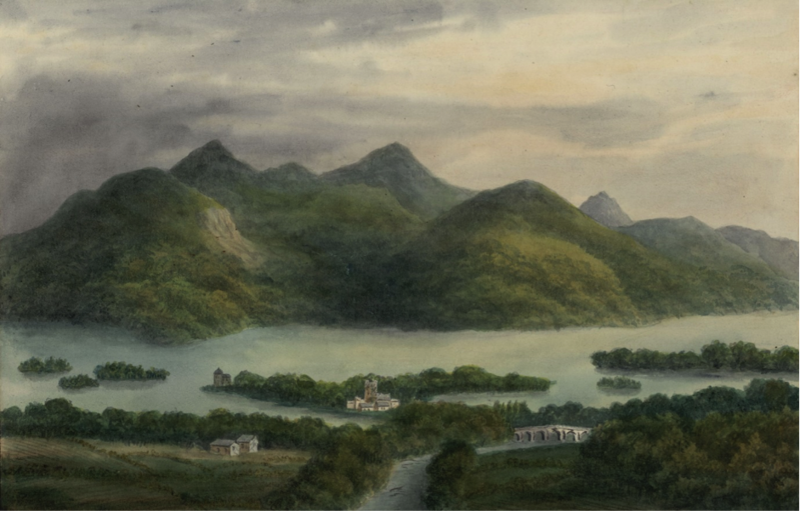 Killarney, by Alphonse Dousseau, Souvenirs pittoresques (1830s). Source: National Library of Wales. As William Williams and Luke Gibbons have shown, the Killarney Lake Experience has by now become a kind of locus classicus in the history of Irish tourism; it seems both apt and amusing that Pennant should have taken part in this ‘tourist ritual’ during its earliest stages. There is much to be learned from this hastily-jotted journal and the few accompanying letters, not only about Pennant himself as a young man on his first major journey from home, but about the ways in which his experience of Ireland and Irish society (in all its political and cultural complexity) might have shaped his responses to his Scottish tours, undertaken some fifteen years later. It meshes Pennant’s Tours still further into those ‘four nations’ or ‘archipelagic’ conversations which have contributed so much to our understanding of the eighteenth century in these islands. Some of the people he met and the places he visited are well-known, but researchers of C18th Ireland –academics, local historians, genealogists–will certainly be able to shed light on more obscure details. We would be delighted to hear from anyone who can help; all contributors will be acknowledged in our final edited version. We look forward to working closely with colleagues in Ireland to unpick some of the more elusive events and encounters hidden between its scrawled lines. This entry was posted in Research Blog on 22nd June 2017 by Luca Guariento. Fat glossy pheasants catch the light between fields of greylag geese. Others are dead in the road, having made it through the shooting season only to find their snapped tail feathers nodding in the slipstream of passing cars. Then Nigel spots a red squirrel in the roadside canopy. 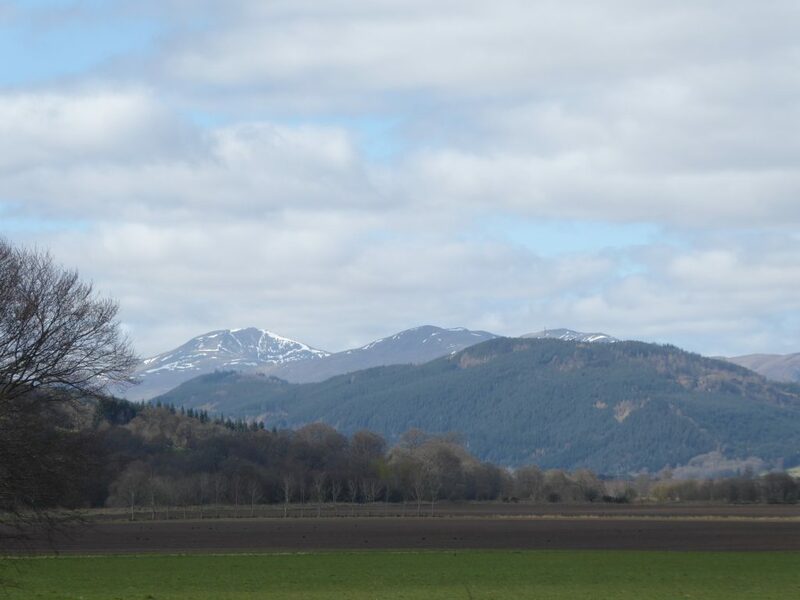 Perthshire in early April. 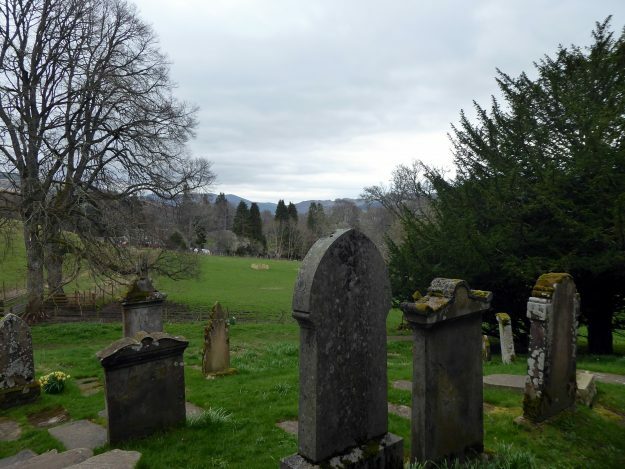 We’ve come here to transcribe a handful of Thomas Pennant’s letters at Blair Castle, but also to pick up his trail in a part of Scotland that neither of us know well. 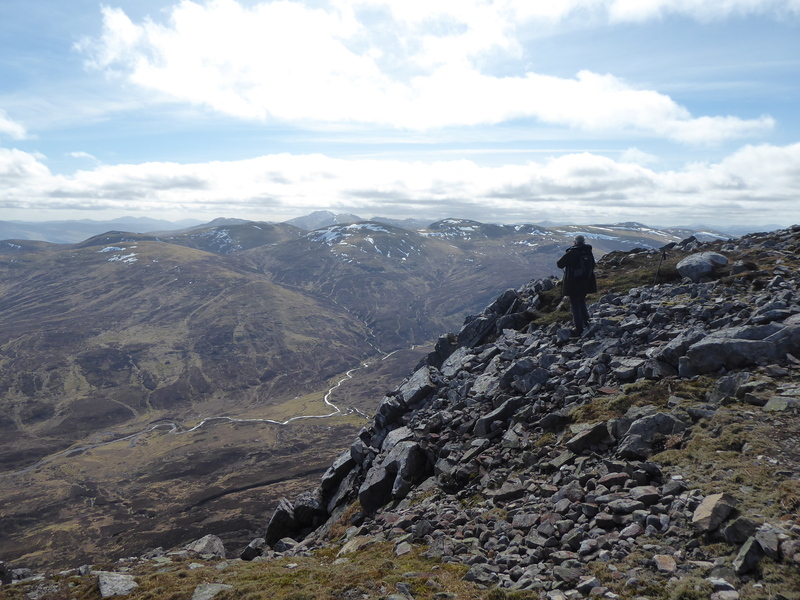 And then there’s the chance to walk Schiehallion, the long mountain that aligns Stob Dearg on the other side of the watershed with the sweeping river valleys of Tayside. This part of the map is thick with names that drew eighteenth-century tourists: Blair Atholl, Killiecrankie, Birnam wood and Dunsinane, and the rivers Tummel, Lyon, Garry, Braan and Tay. 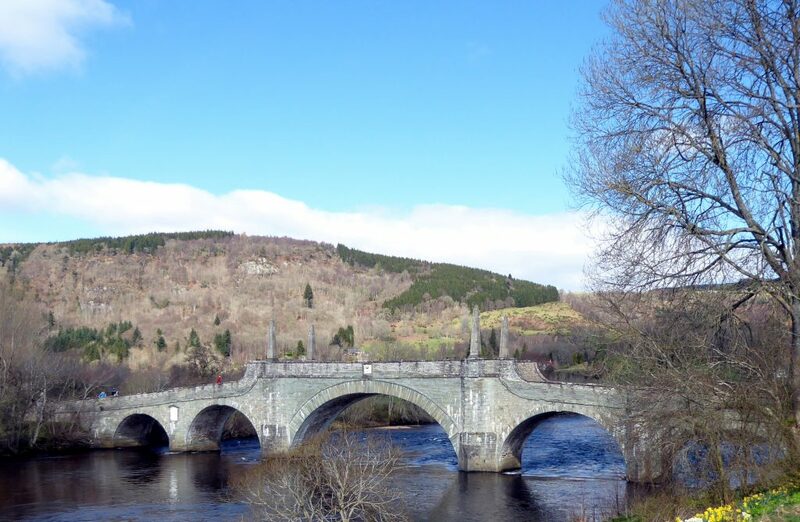 The modern roads here tend to follow the military routes set down by Wade and Caulfeild, so we find ourselves intermittently crossing the paths of earlier travellers on their way to completing the section of ‘petit-tour’ that ran through Dunkeld and Loch Tay to Breadalbane. 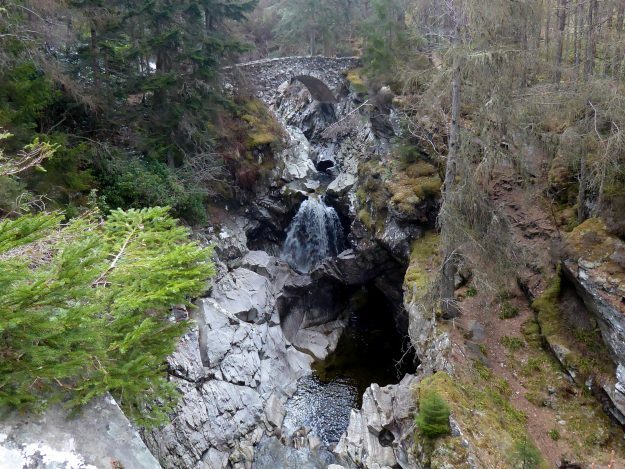 People passing this way often described the defile where the newly mixed rivers race out of the Highlands towards Perth in rapturous terms, a dark chasm whose sides seemed to close above their heads. 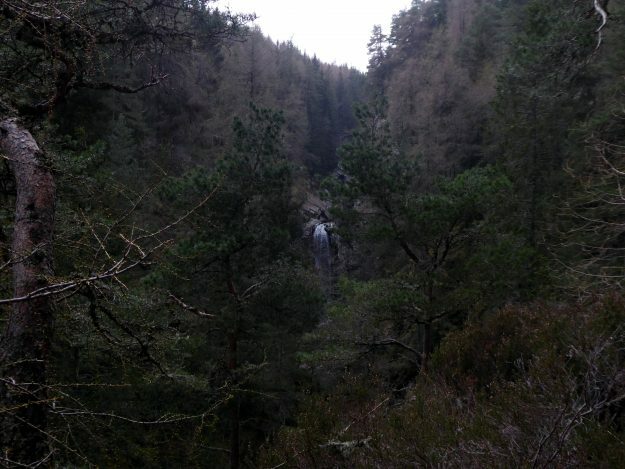 The crags are now thick with conifer plantations, including deciduous larch, which at this time of year hangs above the valley like a rust-coloured mist. 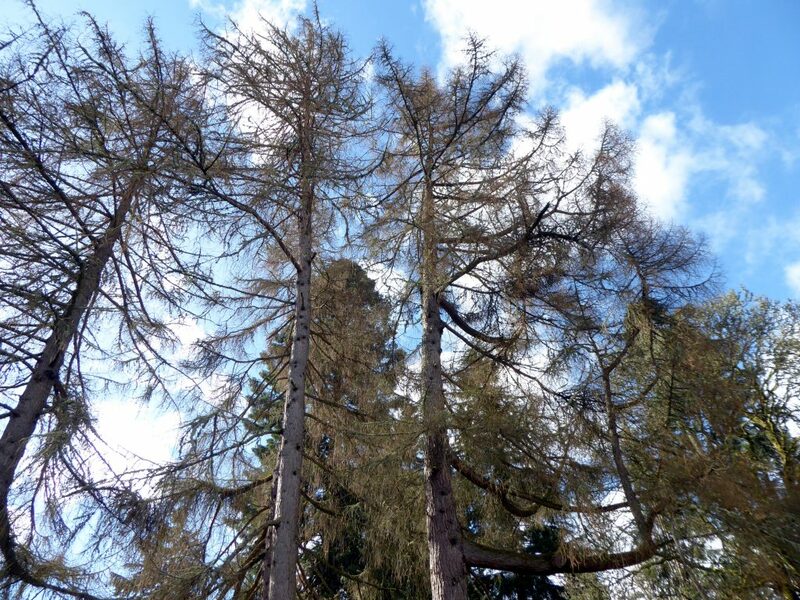 This part of Perthshire is larch country, the legacy of the 4th Duke of Atholl, who dreamed of establishing a lucrative industry supplying the navy with home-grown timber — a story told in Fredrik Albritton Jonsson’s book, Enlightenment’s Frontier. Nigel mentions that the less accessible crags were planted by loading cannon with larch seeds, conjuring up a slightly unsettling image of landscape improvement as aristocratic autocthony. In any case, these valleys must have been used to the ring of gunpowder by the 18th century. 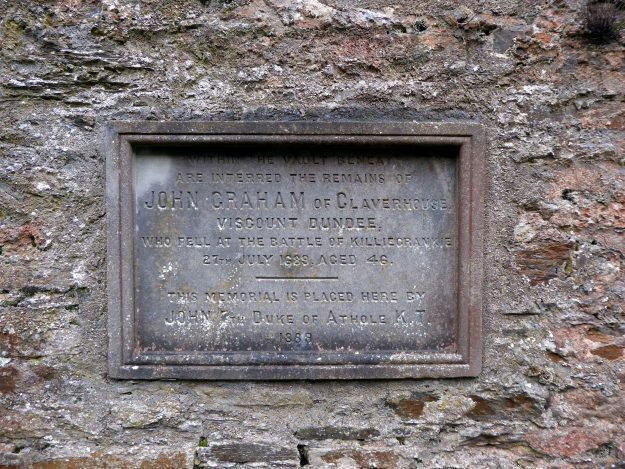 When we stop in Dunkeld for coffee and cake, information boards describe the street skirmishes that took place here between Jacobites and covenanters, as the vicious epilogue to the nearby battle of Killiecrankie. 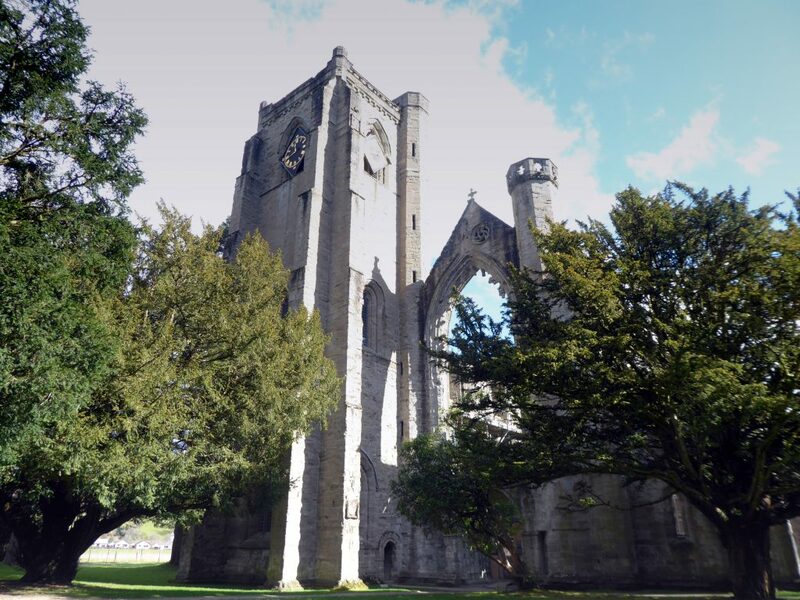 We walk to the ruined cathedral, scanning the walls for pits left by musket balls. When Pennant first visited here it was without Moses Griffith, so the building is illustrated in the 1769 Tour with a view by Paul Sandby. In the cathedral grounds a board points out the 300 year old ‘Parent Larch’, the last remaining ancestor of the trees now crowding the hills around. It seems to have a second trunk growing straight up from one of its branches, like a new tree ready to be deposited — a living picture of its own legacy. As we discovered from reading the correspondence at Blair Castle the next day, Pennant’s characteristically brief account of Dunkeld and the Atholl estate in the 1769 Tour was taken as something of a slight by the Duke, and Pennant had to patch things up in advance of his second visit in 1772.
you see, crossing the indignant Tay. 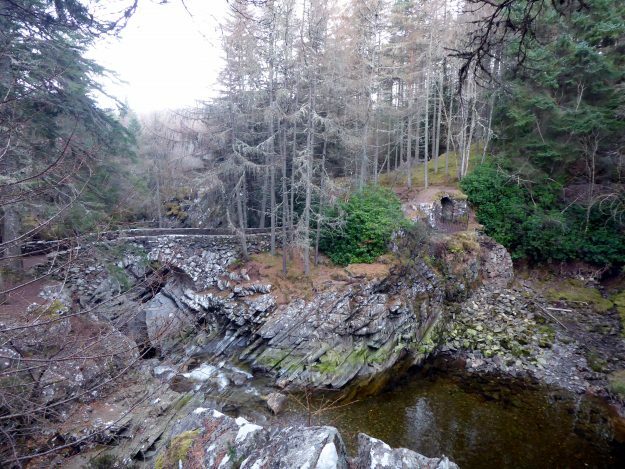 Like Dunkeld and the pass of Killiecrankie nearby, this place is stamped with its history as an insurgent landscape of armed rebellions and braided rivers gradually thinned away. On the riverbank just above the bridge, something else catches my eye. The bright orange of a willow trunk almost severed at its base. 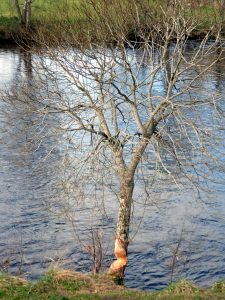 I remember a running controversy about a population of escaped beavers that have made a home in the Tay and its tributaries, gnawing through trees, damming up streams and ditches and flooding fields. 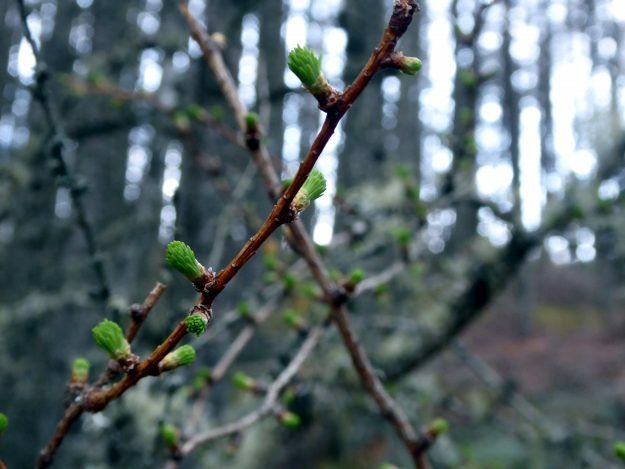 Farmers and landowners here see them as a pest, but others have welcomed their enlivening effect on these valleys and their ecosystems, and are keen for them to stay. Though not native European beavers, I wonder if this landscape will one day be as hard to imagine without their influence as it is without the larch. The ‘G II R’ on the bridge faces our first glimpse of snow across the floodplain, where it lines out the ridges of Schiehallion’s neighbours, Meall Liath, and Meall na Aighean. The air here is getting cold, and we decide to cross the Tay and head for the mountain. 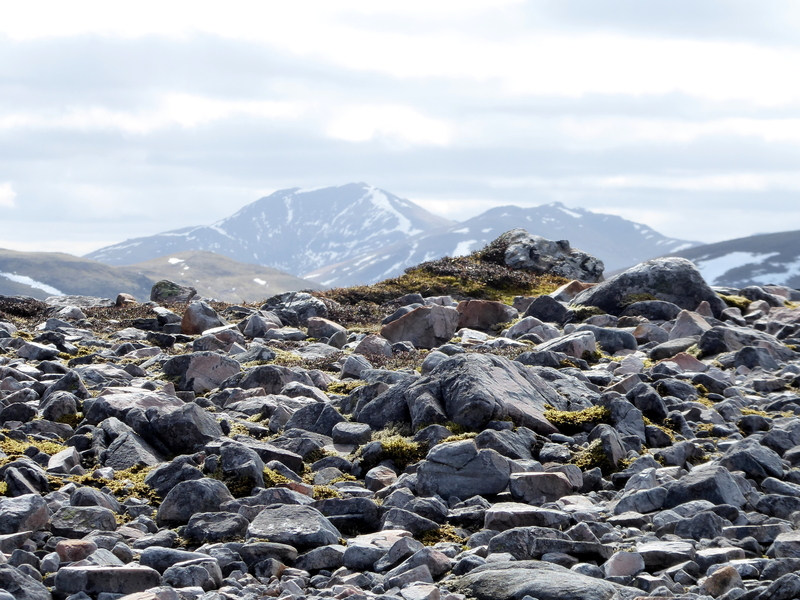 I’ve climbed Scheihallion once before — in almost total cloud cover — and been lucky enough to glimpse a ptarmigan making for cover among the boulders of the upper slopes. 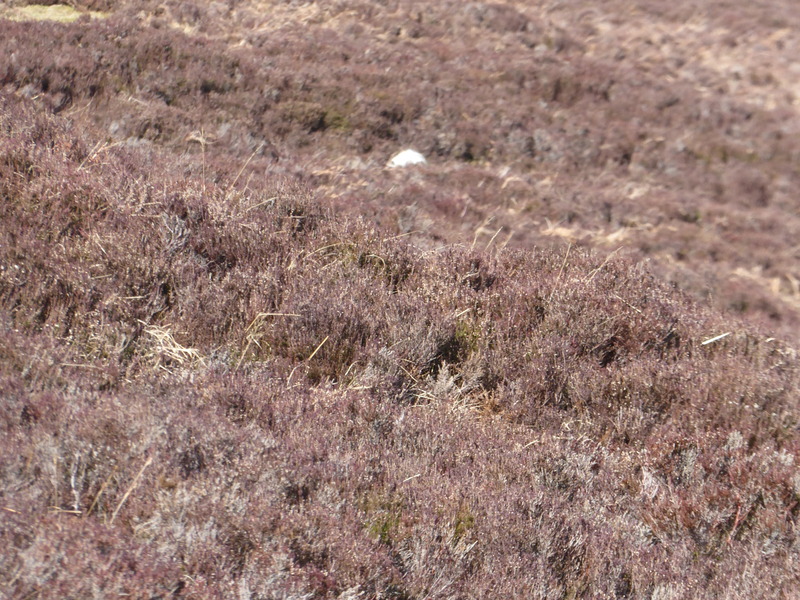 Pennant calls them ‘silly birds, and so tame as to suffer a stone to be flung at them without rising.’ He’s more sympathetic of the ptarmigan’s mountain neighbour, the White Hare, which is described as ‘full of frolick’ and ‘fond of honey and carraway confits’. When I was last here the mountain lived up to its Gaelic name, which translates as ‘The Fairy Hill of the Caledonians,’ the sheets of cloud racing by gave a confusing feeling of forward movement while I stood still on its rocky top. The good weather has put paid to any chance of mountain hares and ptarmigans today, but it’s hard to begrudge the bright procession of walkers we pass on the way up and down the hill, taking in the clear views and open sky. Pennant mentions passing a ‘rocky hill called shei-hallen or the paps’ in 1769, but as a memorial at its base reminds us, it found a different source of fame in the eighteenth century as a scientific test site. 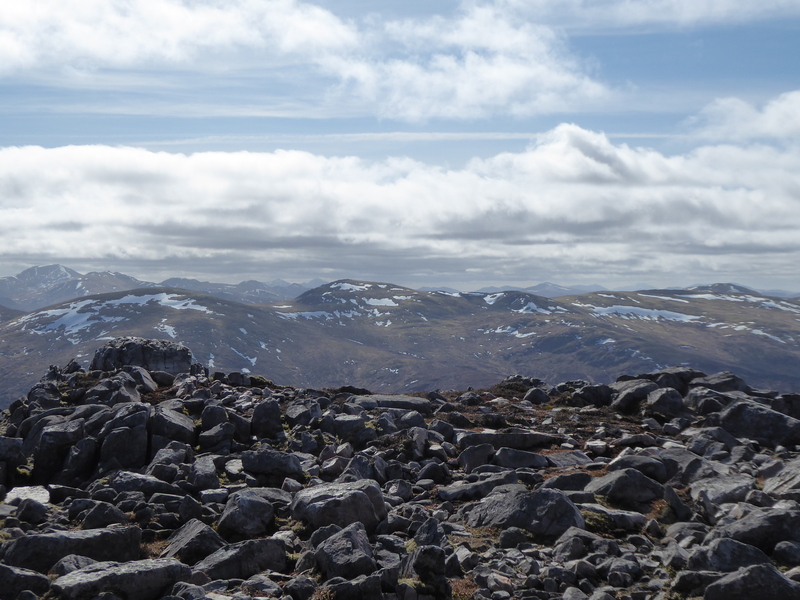 Scheihallion’s shape, isolation and east-west alignment recommended it to the Astronomer Royal, Nevil Maskelyne, as a place to observe the ‘attraction of mountains’. Using an instrument called a zenith sector, Maskelyne observed the deflection of a silver plumb line bisecting a telescope view of the celestial meridian. Measured against the positions of the stars at a certain time, tiny movements in the line revealed the gravitational pull of the mountain itself. 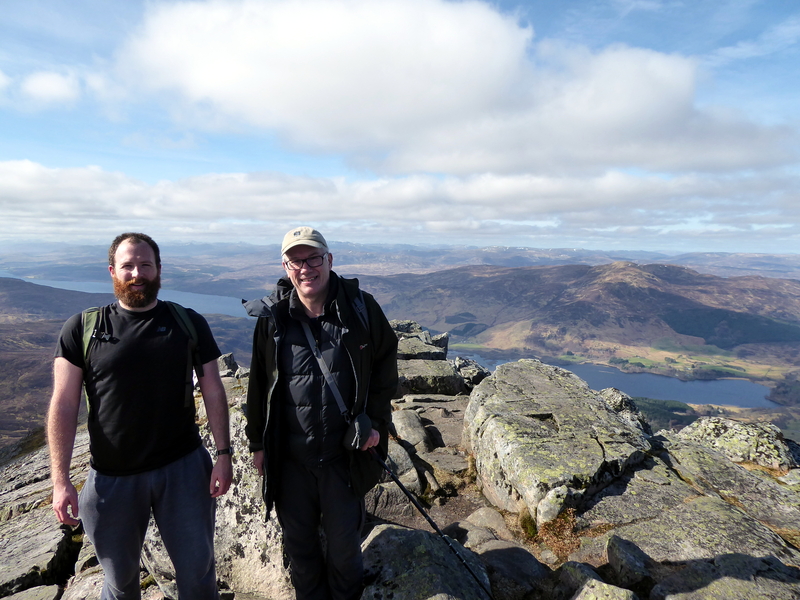 Between the astronomical observations and a survey of Schiehallion’s shape and composition, the experiment provided evidence of Newton’s theory of gravitation, and of the density and shape of the entire Earth. 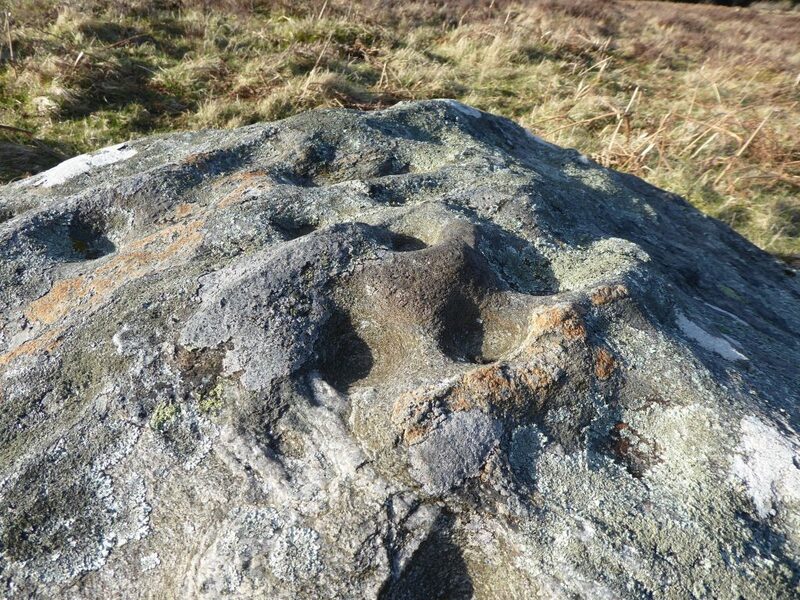 Apparently the footprints of Maskelyne’s parallel observatories on the north and south slopes of the mountain can still be found by those who know where to look, but we stick to the path, spotting only sheep fanks and the spreading cairns built-up by walkers. 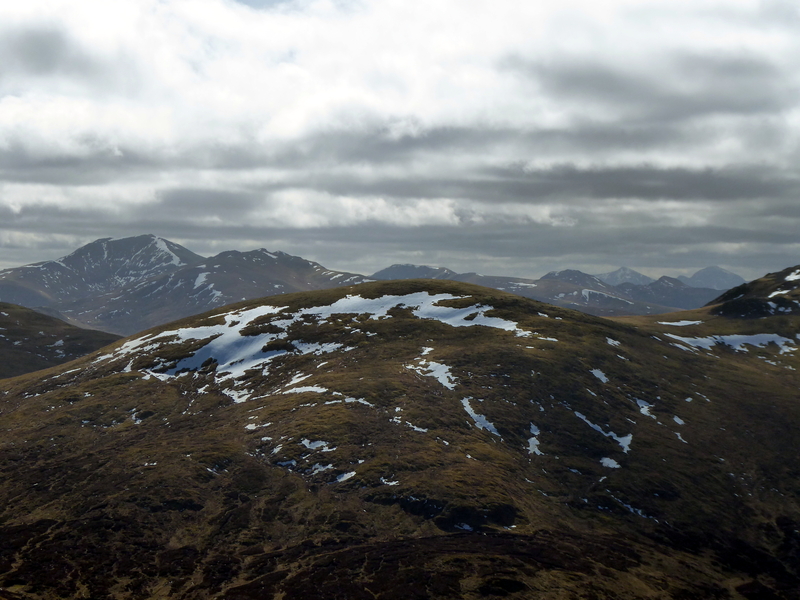 As we climb, the mountains around begin to rise up around us, gathering into blue and white heaps towards Breadalbane, marked by the twin ridges of Ben More and Stob Binnein. 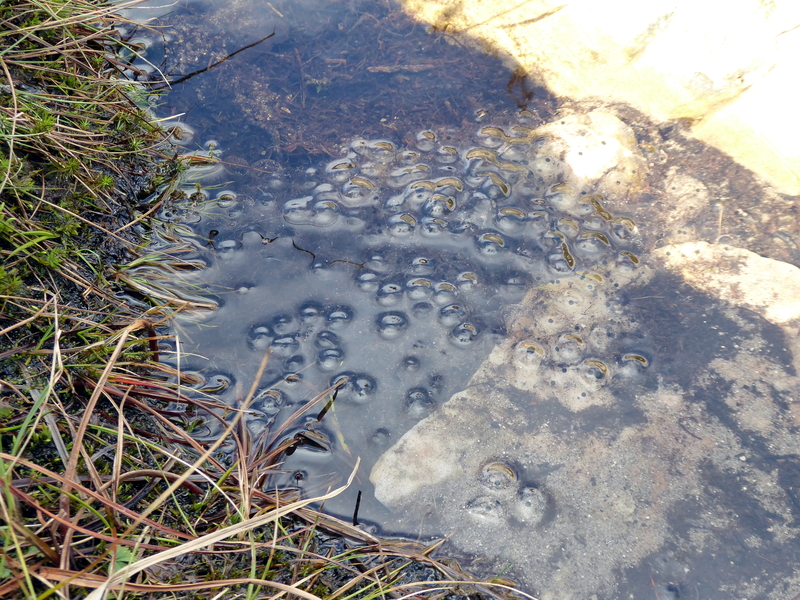 We spot a few clusters of frogspawn in the path-side ditches, covered by water that might have fallen as snow a few weeks ago — though we’re both struck by how little snow there is on the mountain for this time of year. 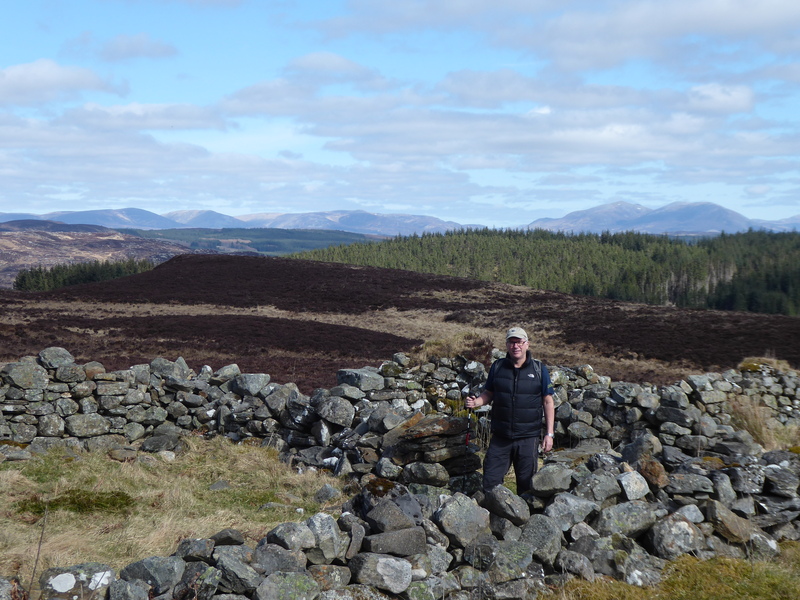 As we make our way up the long ridge we can see down to the bright blue Lochs of Rannoch and Tummel in the North, and onto a web of burns and springs catching the sunlight in the south — like snail trails, says Nigel. 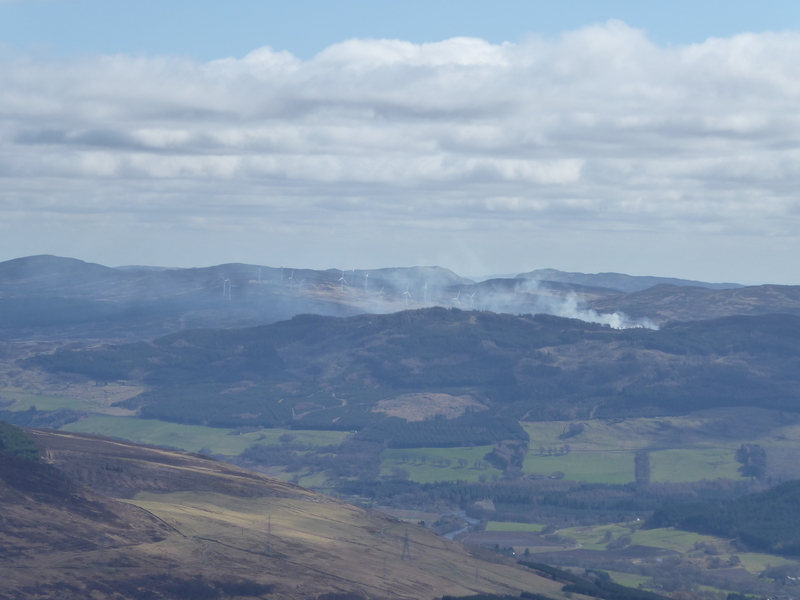 In the distance what looks like smoke from late-season muirburn rises in front of a windfarm. 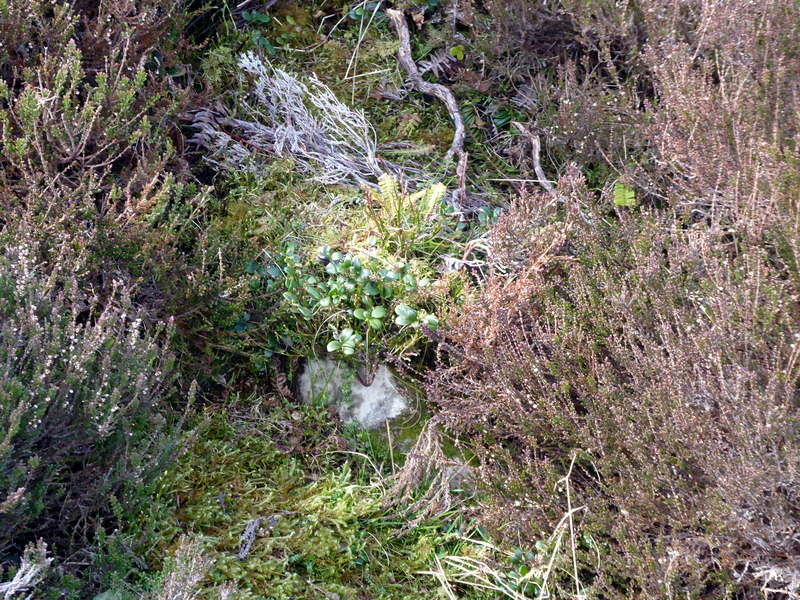 At our feet there are cow or blaeberry leaves tucked between the heather, sphagnum, and occasional hare droppings. I’m reminded that Nigel and I have different feelings about ledges and heights, as I watch him peering down to the valley floor, sometimes adjusting his backpack or camera while standing next to a long fall. I prefer to stay a body’s length away from any drops when I can, and there’s a moment near the very top when this looks like a wise philosophy, as Nigel almost loses his footing on a piece of broken quartzite. I hear a shout and a flurry of footsteps chasing their balance behind me, but he manages to stay upright. We agree that he’s been tripped up by the fairies, pulled off-centre like Maskelyne’s silver plumb line. At the summit the view into the west suddenly opens over the blue-bronze haze of Rannoch Moor to Glencoe. 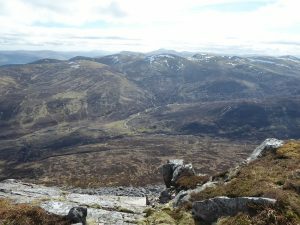 From those hills Schiehallion takes on a conical shape, its long body hidden behind its steep western aspect. We stay as long as we can at the top, and on the way back down a grey partridge breaks cover on the path in front of us, before fluttering away into the heather. At the foot of the mountain the low sun brings out the declivities on a cup-marked stone. An information board nearby marks Allt Creag a’ Mhadaidh — the Burn of the Crag of the Wolves — winding its way between grouse butts and the remains of shielings: it’s a name like Schiehallion, that remembers somebody else’s world. As we drive away we spot an eagle slowly orbiting a cluster of Sitka spruce, Scots pine, and bright orange larch. We arrive at the Atholl Arms in time for a drink in the beer garden, as the train from Inverness to London passes by on the adjacent track. We’re a stone’s throw away from the gates to Blair Castle, and the hotel is similarly decked-out in fading baronial style. We eat under high wooden beams and coats of arms in the hotel dining room. At the side is a display of stuffed game birds, including a huge Capercaillie. In what feels like a quiet act of care, someone has written a note giving the bird its name and the story of its reintroduction. After dinner we wander around the village, where we can hear barn owls calling from the castle grounds. There’s a footbridge here across the River Garry. Pennant called it ‘an outrageous stream, whose ravages have greatly deformed the vally, by the vast beds of gravel which it has left behind.’ It seems to be confined to a single channel now, with the railway on one side and the main road rushing along the other. As we stand in the middle of the bridge with the black water flowing beneath, the pinprick glow of a satellite drops across the night sky and behind the trees. 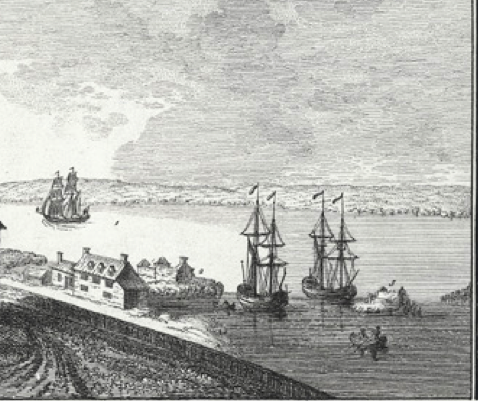 Thomas Pennant, A Tour in Scotland 1769, (Chester: 1771), p.79. Precision in Scotland, 1774’, Science in Context, 22:03, 2009, pp.323-340. This entry was posted in Walkers' Blog on 6th June 2017 by Alex Deans. 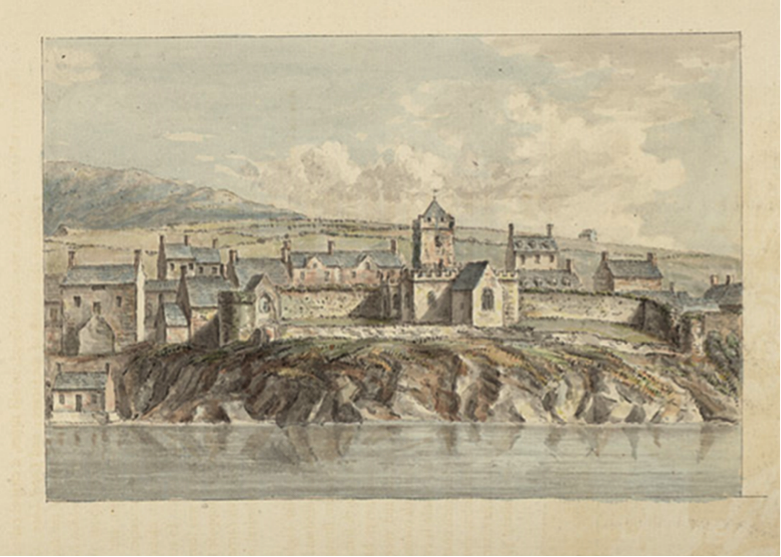 We’re excited to announce the addition of a new itinerary to our map viewer: Samuel Johnson and James Boswell’s 1773 tour to the Hebrides. This will allow us to visualize the ways in which these influential tours of Scotland overlapped and diverged, and of course, see how they line up next to a selection of historical maps provided by the NLS. Pennant and Johnson might have been less happy to see their travels presented side by side. Annoyed by a ‘fling’ at him in Johnson’s Tour, and perhaps by the competition it represented to his own Voyage to the Hebrides, Pennant asked his correspondent George Paton to look out for ‘any strictures’ on Johnson in the press, and wrote that he would not acknowledge Johnson in his own work: ‘for really he is not worth notice.’ Nonetheless, we hope that that this will be the first of several Curious Travellers crossovers between Pennant and Johnson, as we look at the impact they had upon later tourists as well as each other. This entry was posted in News on 3rd June 2017 by Luca Guariento.